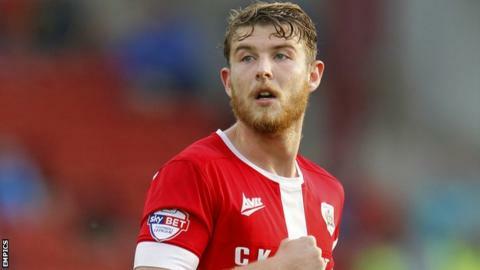 Barnsley's top-scorer Sam Winnall has scored 10 goals in all competitions this season. Barnsley made a perfect start to the new year with victory over Millwall. The home side took a deserved lead through top-scorer Sam Winnall, who rose highest to glance home a header from Adam Hammill's cross. But the Lions were level just after the hour as Joe Martin's shot rebounded to grateful skipper Steve Morrison who tapped home from close range. Parity was short-lived as Hammill skipped past two defenders and finished low to restore the Tykes' lead. Barnsley are now 17th in the League One table, while Millwall have slipped to 10th place. "The equaliser came at a good time for us and then I thought there was only one team that was going to go on and win it. "Overall, not being as clinical as we could and giving two poor goals away has cost us. "I think we've got to be more organised, more disciplined, communication has got to be better to stop goals like that." Match ends, Barnsley 2, Millwall 1. Second Half ends, Barnsley 2, Millwall 1. Attempt missed. Lee Gregory (Millwall) right footed shot from outside the box misses to the left. Steve Morison (Millwall) hits the bar with a header from the centre of the box. Foul by Michael Smith (Barnsley). Substitution, Barnsley. Michael Smith replaces Marley Watkins because of an injury. Substitution, Barnsley. James Bree replaces Aidan White because of an injury. Attempt missed. Aiden O'Brien (Millwall) header from the right side of the box misses to the left. Byron Webster (Millwall) hits the left post with a header from the centre of the box. Corner, Millwall. Conceded by Aidan White. Adam Hammill (Barnsley) is shown the yellow card for a bad foul. Aiden O'Brien (Millwall) wins a free kick in the attacking half. Corner, Barnsley. Conceded by David Forde. Attempt saved. Adam Hammill (Barnsley) right footed shot from the left side of the box is saved in the top right corner. Substitution, Millwall. Nadjim Abdou replaces Carlos Edwards because of an injury. Goal! Barnsley 2, Millwall 1. Adam Hammill (Barnsley) right footed shot from the centre of the box to the top right corner. Assisted by Sam Winnall. Lloyd Isgrove (Barnsley) wins a free kick in the defensive half. Attempt missed. Adam Hammill (Barnsley) right footed shot from outside the box misses to the right. Attempt missed. Lloyd Isgrove (Barnsley) left footed shot from the centre of the box is too high. Goal! Barnsley 1, Millwall 1. Steve Morison (Millwall) right footed shot from the centre of the box to the bottom right corner. Attempt missed. Conor Hourihane (Barnsley) left footed shot from outside the box is too high. Corner, Barnsley. Conceded by Mark Beevers.